A cyclist from San Francisco was looking for a fun summer bike trip to the shores of the Salish Sea and asked about cycling Seattle to Vancouver, B.C. In a Seattle Times article a couple of years ago I recommended a southbound version of that route, and that is the direction you’d go if following the route in my book Cycling the Pacific Coast. But it’s fun to go the other direction too. There are good hiker-biker campgrounds along the way, and plenty of accommodations in the coastal towns that you’ll visit. Day 2: Port Townsend to Port Angeles to Victoria, B.C. I suggest adding tourism days in there, as each destination has much to offer. There are two good ferry routes to get started toward Port Townsend, the Olympic Peninsula’s little Victorian port city. You can cross Elliott Bay on the Seattle-Bainbridge Island or Edmonds-Kingston routes. Both offer a similar cycling distance to Port Townsend, about 53 miles. Take the wide main road off Bainbridge and veer left toward Poulsbo. Pick up some Norwegian lefse at Sluy’s bakery downtown. It’s great with smoked salmon and cream cheese for a Northwest breakfast burrito as your campground meal. Head north to the Hood Canal Bridge, and after that, take a right on the third road, Center Road, to Chimacum. Hit the farmstand at the Chimacum crossroads for the freshest produce. The Chimacum farmstand sells produce and products from local growers. Roll into Port Townsend on the Larry Scott Trail. Climb the hill via Cherry Street to the hiker-biker camping at Fort Worden, or grab a bed in town. Visit the Paradise Café for a fantastic Italian dinner. Port Townsend from the Larry Scott Trail. Another 50-plus mile day, with a couple of climbs, takes you to another peninsula port city. Head out of Port Townsend the way you came in, on the trail. Then take the main highway, SR 20, west. Be careful on this section, as it is curvy with no shoulder. But you’re heading downhill toward Discovery Bay, so it will be a fairly fast six miles. There’s a healthy climb from Discovery Bay, then you’re on and off the main highway, using Old Gardiner Road to escape the traffic. At the Jamestown S’klallam tribal headquarters, pick up the Olympic Discovery Trail, which is a joy. This paved multi-use trail takes you all the way to Port Angeles, except for a bit of residential street riding in Sequim. At 36 miles, Sequim is a great place for lunch. Head south on Sequim Avenue a few blocks to its town center for cafes. The Olympic Discovery Trail at Port Angeles. You could stay the night in Port Angeles, a quiet town with a cozy waterfront setting. The town faces the Strait of Juan de Fuca with its shipping traffic on the waves of the Salish Sea, and it backs up to the foothills of the Olympic Mountains, snowy peaks towering. There’s no hiker-biker camping in town, but there’s a first-come/first-served camping at Heart O’ the Hills Campground, partway up the challenging Hurricane Ridge Road south of town. Or you can bike back to Sequim for hiker-biker camping at Dungeness County Park, a stellar spot on the edge of the Dungeness Spit. You also could take the late afternoon run of the Black Ball Ferry’s M.V. Coho to Victoria and spend the night there. If you’re on a time budget, do that, because it will give you an evening in Victoria, a stately city on Vancouver Island’s southeast corner, with much to offer tourists. 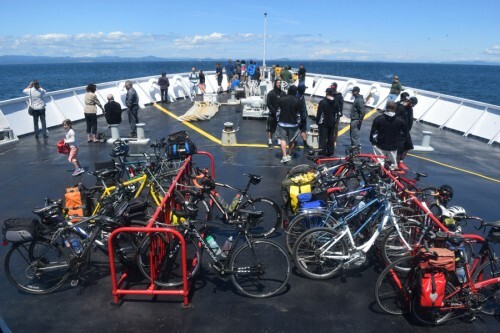 Bike parking on the MV Coho is conveniently on the forward deck. Day 3 is easy compared to the first two rides. You’ll pedal the beautiful Lochside Trail, which is mostly paved trail, a bit of unpaved but hardpacked ground, and occasional residential streets. It’s just 22 miles, giving you the morning to enjoy Victoria and a leisurely ride. Lochside Trail is intermittently unpaved with a very nice hard-packed surface. And a wonderful tree canopy. And horses. Swartz Bay is the site of the big BC Ferries terminal, with boats to the nearby Gulf Islands and a boat to the Tsawwassen ferry terminal on the mainland, your gateway to Vancouver. If pressed for time, just head straight to that ferry in the morning, take a midday boat and pedal on into Vancouver in the afternoon. It’s a 90-minute crossing, and there’s another 36 miles to pedal into the city from the ferry terminal, so plan accordingly. If you have time, enjoy the Lochside Trail and this part of Vancouver Island, called the Saanich Peninsula. There’s plenty to see but not much to do. You’ll share the trail with a lot of friendly locals. Most of them turn around at Sidney, the largest town near the Swartz Bay ferry. Here’s a short video that provides the flavor (or, flavour!) of the Victoria-area trail system. Sidney is a good place for meals and to provision for camping, or get lodging. The small, wooded McDonald Campground, which offers discounted fees for cyclists, is near the ferry terminal, just north of Sidney on the trail by the North Saanich Yacht Club. Hit the ferry dock for an early departure, which will land at Tsawwassen by mid-morning, and you’ll be in the outskirts of the city by lunchtime. Cross the, flat farmland of the aptly named Delta region, then climb over the impressive Alex Fraser Bridge, which has a generous protected sidewalk trail. A second, shorter bridge takes you across the Fraser River’s Annacis Channel, and then you’re pedaling along River Road, next to the north arm of the Fraser. This is a challenging six-mile section; River Road can be busy with commercial traffic, and there are sections with no shoulder. Vancouver visible in the distance from atop the Fraser River Bridge. On the edge of Richmond you cross the river on a multi-use trail attached to the Canada Line light rail, and then you’re in Vancouver. Take the Ontario greenway straight north through city neighborhoods to its end at the crossroads of all Vancouver biking: the south edge of the False Creek trail. With the science center as a backdrop, bike trails meet on False Creek at the north end of the Ontario Street greenway in Vancouver. I hope you have time to bike around these cities too, because each has a lot to offer. For instance, don’t just fly into Seattle and leave—book an extra day or two and discover stunning views from our Alki Trail, and the delightful neighborhoods like Ballard, Fremont and the University District linked along our Burke Gilman Trail. In Victoria, try their other major trail, the Galloping Goose, which connects to the Lochside and has its own charms. See more detail in my article on Cycling the Saanich Peninsula on Vancouver Island. In Vancouver, follow the Adnac greenway to East Van or the Cypress greenway through funky Kitsilano. There’s a lot of great cycling, from urban to rural, around the shores of the Salish Sea. I hope you enjoy this route.